The Ethiopian wolf, also known as the Abyssinian Wolf or Simien Jackal, is believed by some scientists not to be a true wolf. 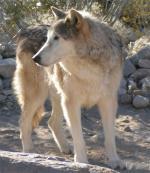 However, DNA studies show it to be more closely related to gray wolves and coyotes than to any other African canines. It is the most endangered canine species in Africa, and, among wolves, its rarity is second only to the red wolf. It inhabits only a few mountain pockets of the Ethiopian highlands. There is believed to be fewer than 450 alive in the wild. The largest concentration of Ethiopian wolves exist in the Bale Mountains National Park. The people living in the Bale Mountains own on average 2 dogs per household in order to protect their livestock. Although the wolves' habitat has constantly dwindled as a result of human encroachment, its greatest threat of extinction is a recurring epidemic of rabies which is transmitted from domestic dogs with whom the wolves compete for food. 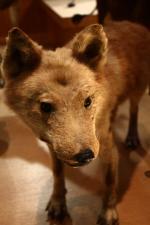 The Ethiopian wolf has long legs and a long muzzle, resembling the coyote in both shape and size. It has a distinctive reddish coat with a white throat, chest, and underparts, broad pointed ears, and a thick bushy black tail with a white base. It ranges in size from 43 to 55 inches (tip of nose to end of tail) and weighs from 24 to 42 pounds. 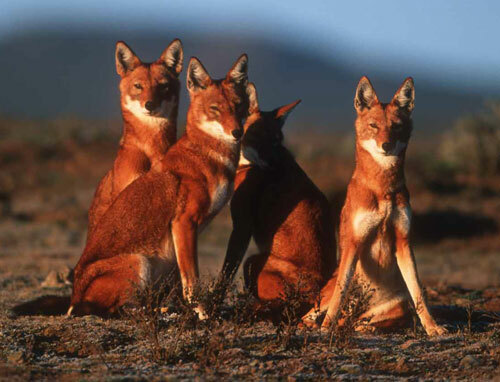 By nature, the Ethiopian wolf hunts by day, but it is found to sometimes be nocturnal in areas where it is persecuted. Though they live in packs which share and defend their territories, they almost always hunt alone. Rodents make up over 90% of their diet, but they occasionally feed on small antelopes, hares, and hyraxes. Breeding season usually occurs between August and November. During breeding season and pregnancy, the female's coat turns a pale yellowish color and her tail turns brownish and loses hair. The dominant female of the pack gives birth to a litter of 2 to 7 pups between October and January. Full maturity is reached at 2 years. The only real predators other than humans are spotted hyenas and tawny eagles that occasionally prey on unattended pups. Life span in the wild is about 8 to 10 years.